A home bowling alley is built a lot different than the high class commercial bowling alleys. There are no lounges or clubs to accompany these alleys, but they are still the most important areas in your house where you spend time and have fun with friends and family. There are a number of improvements you can do to the home bowling alleys in terms of design and ambiance. Often when I visit the popular bowling areas in my neighborhood I find them extremely crowded as well as loud. We all have our reasons to spend time with friends bowling and mine is to spend some quality time in a quiet and pleasurable environment. This is why none of the commercial bowling alleys are suitable for the purpose and there is no fun. This is why I decided to get a home bowling alley so that I can start spending quality time with friends and family whenever I want. After it got my alley lane installed I came to know of a lot things that can drastically improve your home bowling experience. Speaking of the improvements, first major makeover needed is in the area where the bowling lane is installed. Often owners do not pay enough attention at improving the area around the bowling lane as per the standards of a quality experience. What I would suggest is that you start with furniture. Replace the plastic chairs with leather or velvet sofas. Even if you have ratty benches around the home bowling alley, replace them too. Ratty benches and plastic chairs are not comfortable seating and this is why you need to get them replaced with a more comfortable arrangement. If you are a fan of elegance then home bowling alleys can be designed to indicate the same. You can color coordinate the bowling alley installation like have bowling balls, bowling pins and bowling shoes of the same color. I know for some of you it seems like an unnecessary investment, but when you are already spending huge amount on getting the bowling alley setup at your home such improvements seem minuscule expenses, but greatly improve the bowling experience. You must have visited the five star commercial bowling alleys and know how alluring ambiance these places have. I think one of the major factors that contribute to the ambiance is the music setup in these places. We all like to hear songs play when we are bowling and you can use this to improve your bowling alley setup. However, before you think of installing a music system in the area you need to factor in a few considerations. 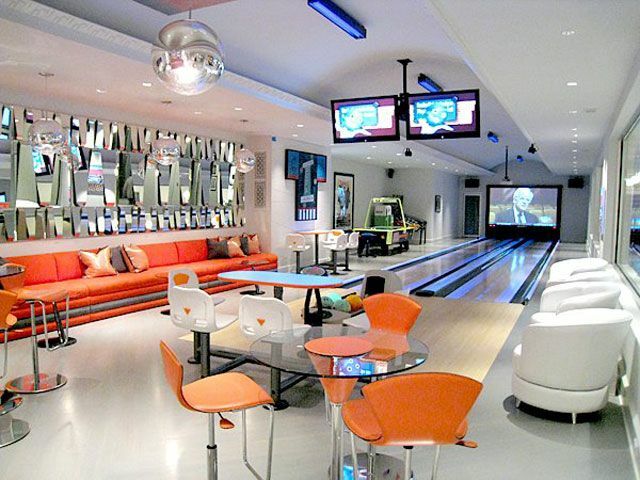 You bowling space should have enough buffer area so that the sound of music does not disturb other areas of the house. Also, a major consideration is considering the comfort of your neighbors. The sound of music must not disturb them. Fortunately, there is sound proofing available to allow you to have a music setup without disturbing anyone.